Iran has barred national football team captain Javad Nekounam’s lucrative transfer to a club in neighboring UAE because of a dispute over a name, media reports said on Sunday. Nekounam, 32, who captained Iran in qualifying for the 2014 World Cup finals in Brazil, visited the United Arab Emirates earlier in the week to finalize a deal with newly-promoted club Sharjah. But the move -- reportedly worth more than two million dollars -- has been blocked by Iranian authorities, Iran’s football federation chief Ali Kafashian said, quoted by Fars news agency. 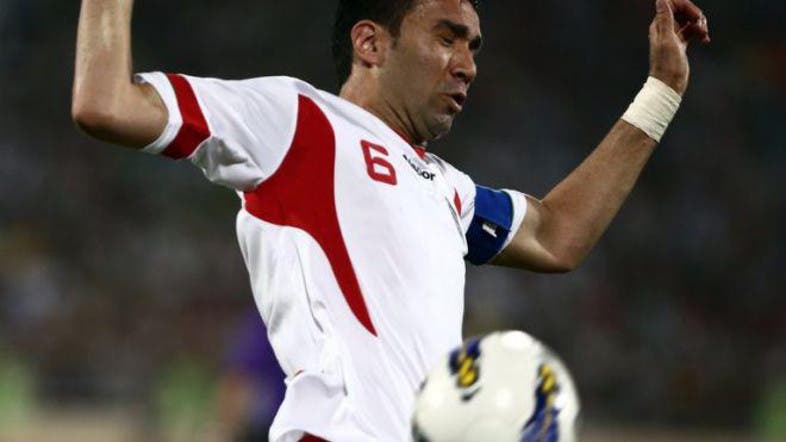 He did not elaborate why Nekounam had been “denied permission” to join Sharjah, but Iranian media said the decision was taken to stop the veteran international from playing in the UAE’s newly-renamed “Arabian Gulf League,” a rebranding which has stirred tensions. Historically sensitive towards territorial issues, Iran insists on calling the body of water the “Persian Gulf” and argues that historical evidence, including ancient maps, show it has always been “Persian” and part of its territory. The Islamic republic, whose own football federation has named a “Persian Gulf Cup,” staunchly defends that stance and observes a “National Day of the Persian Gulf” each year on April 30. Iran and the UAE are also in dispute over the sovereignty of three barren islands near the strategic Strait of Hormuz at the entrance to the Gulf. On Sunday, Kafashian was quoted as saying that “eight or nine other players are in the same boat” as Nekounam. They have also been banned from joining UAE clubs and would be compensated. He said efforts were underway to find a legal settlement to terminate the contract of another Iranian international, Mohammad Reza Khalatbari, who signed a contract with UAE club Ajman before the league was renamed. The dispute over the Gulf’s name is not a new development in a region where Shiite powerhouse Iran and its Sunni rival Saudi Arabia have long vied for supremacy. The 2010 edition of the Islamic Solidarity Games, due to have taken place in Tehran, was postponed and later cancelled over the same naming row. And in 2010, Iran warned that airlines using the term “Arabian Gulf” on in-flight monitors would be barred from its airspace.